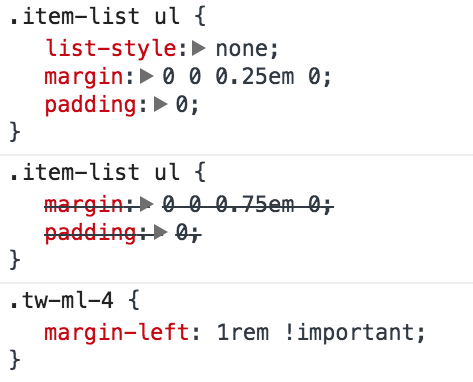 It generates a number of utility classes that you can add to your theme's markup to apply different styling, as well as the ability to apply classes to other markup and create components comprised of utility classes using a custom @apply PostCSS directive. Require PostCSS and Tailwind via npm or yarn. Generate a configuration file using ./node_modules/.bin/tailwind init. Tweak the settings as needed. Configure your build tool (Gulp, Grunt, Webpack). Include a path to the generated CSS in your MYTHEME.info, MYTHEME.info.yml or MYTHEME.libraries.yml file. By adding a prefix like tw-, we can ensure that the Tailwind classes don’t conflict with core HTML classes like block. We can also ensure that they won't conflict with any other existing HTML or CSS. We can also set the !important rule on all Tailwind’s generated classes. We need to do this if we want to override core styles which have more specific rules. 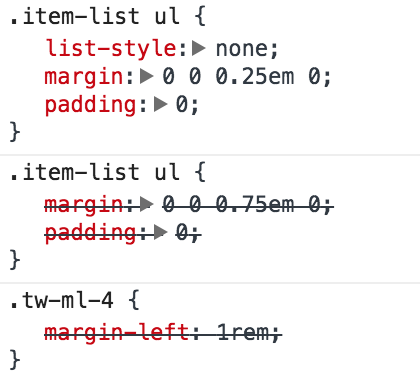 For example: if I had this core markup then the left margin added by tw-ml-4 would be overridden by core’s .item-list ul styling. With the !important rule enabled though, the Tailwind’s class takes precedence and is applied. For an example of Tailwind within a Drupal 8 theme, see the custom theme for the Drupal Bristol website on GitHub.